Three young members of the Traditional Mass community in Reading received their First Holy Communion today. Immediately after Mass, one of them crowned the statue of Our Lady with flowers. 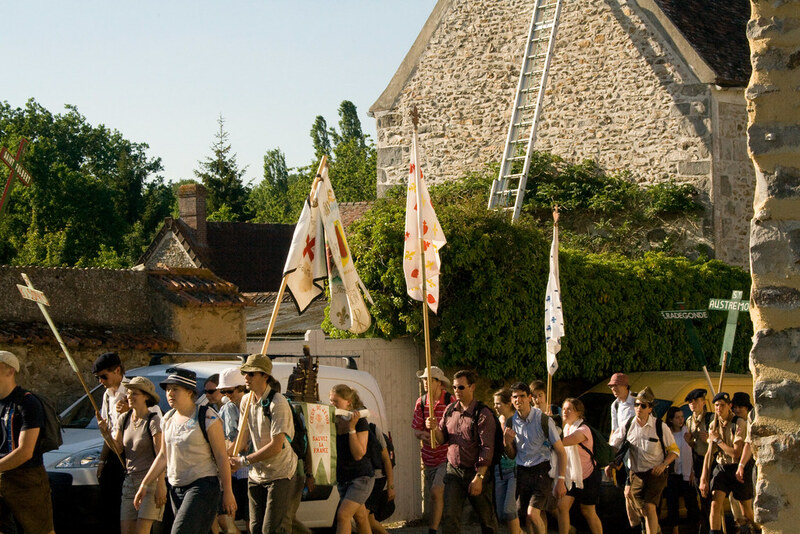 The Paris to Chartres Pilgrimage organised by Notre Dame de Chretianite is the biggest and longest organised pilgrimage in Christendom (the pilgrimage to Santiago de Compostella, of course, is not a single 'organised' pilgrimage in the same way). 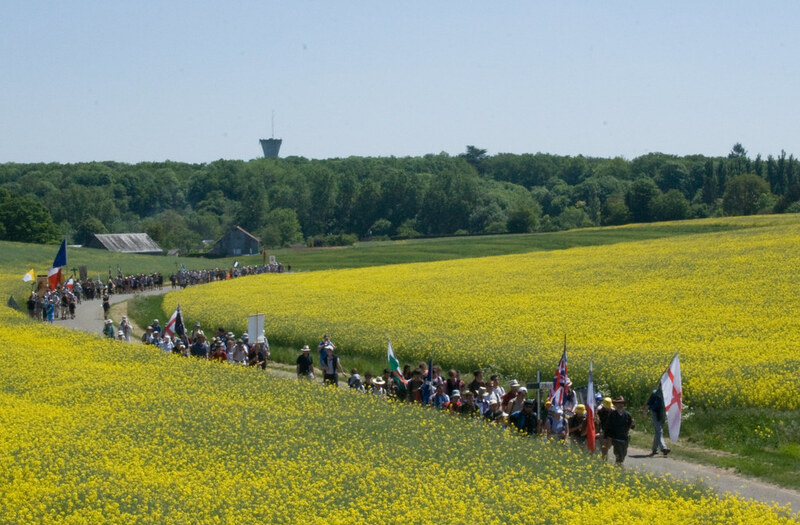 It is also by far the biggest event of the Traditional Catholic scene, a great inspiration for everyone who does the pilgrimage. It is extremely well organised, and while I have no 'inside' information it is worthwhile to explain something of how it works, at least from the perspective of an ordinary participant. 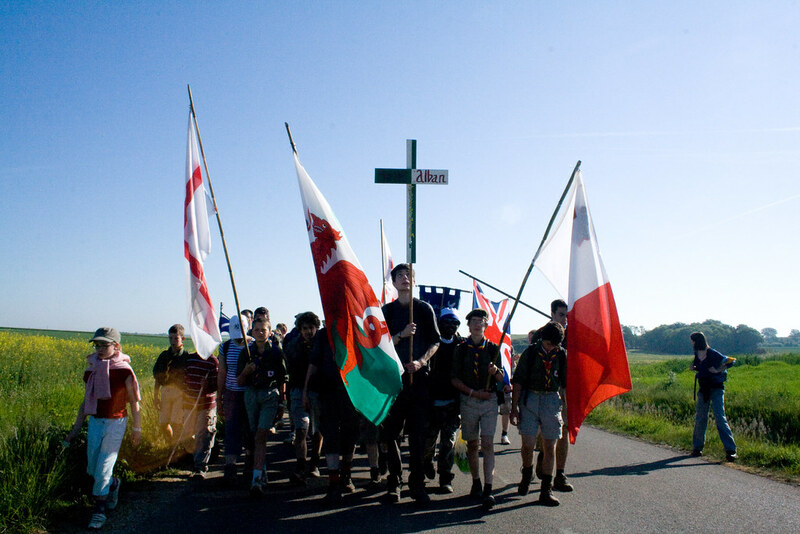 plus a chapter composed of boys from Chavagnes International College, dressed in scout uniforms who for the most part carried banners in the other three chapters. 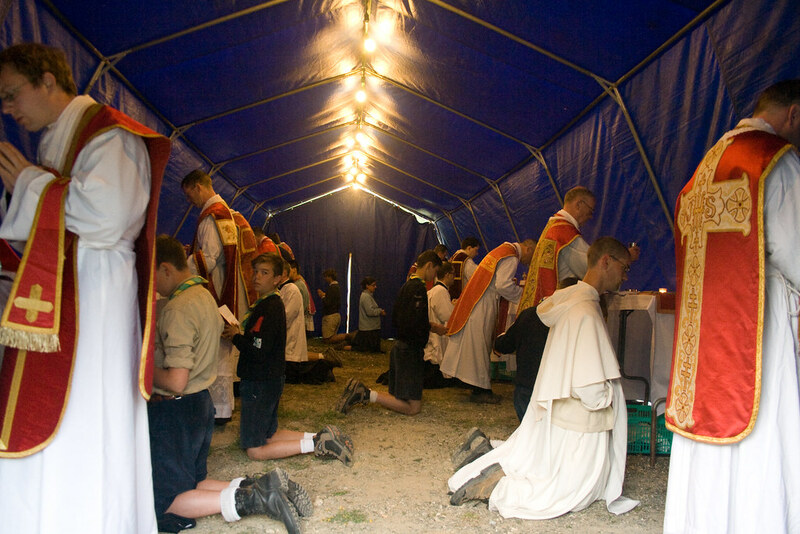 Here they are at Mass on the Saturday. 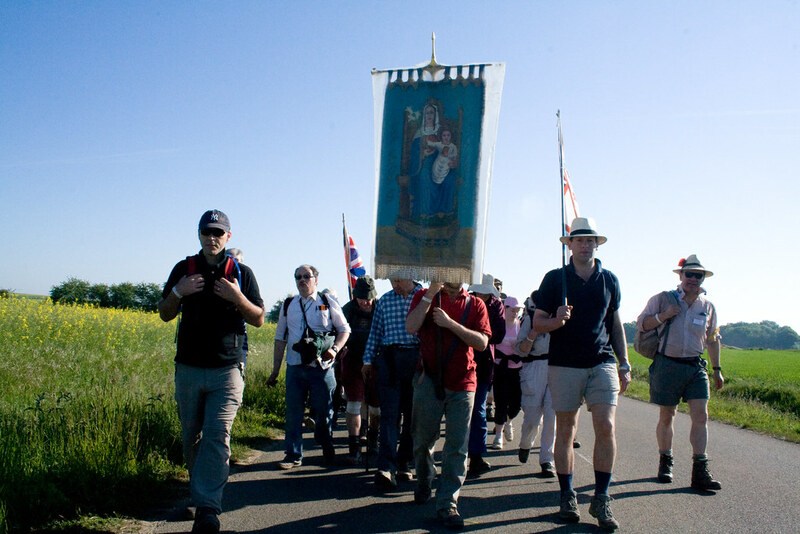 Chapters are quite small : ours were only about 25 people each, and in practice were often less than that as people dropped out (some people also join the pilgrimage at later stages, so there are more in Chartres than left Paris). There are getting on for 200 chapters in total, and although I took a lot of photos of chapter banners in different contexts these are only a selection. 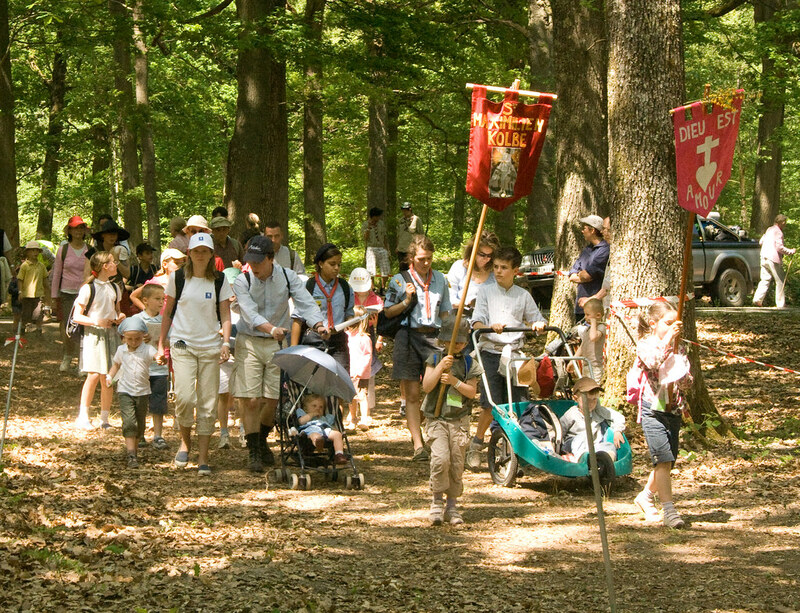 The American chapter, for example, I only ever saw from a distance, although I met some of them later in Chartres. In addition to the official British group, there was a group of British friends who travelled by minibus and greeted us at various points on the journey. Finally there are are special chapters for children and for families, who do a reduced version of the walk. We didn't have any of these this year ourselves. Chapters walk together with gaps between them, which is important to let cars pass and so forth. 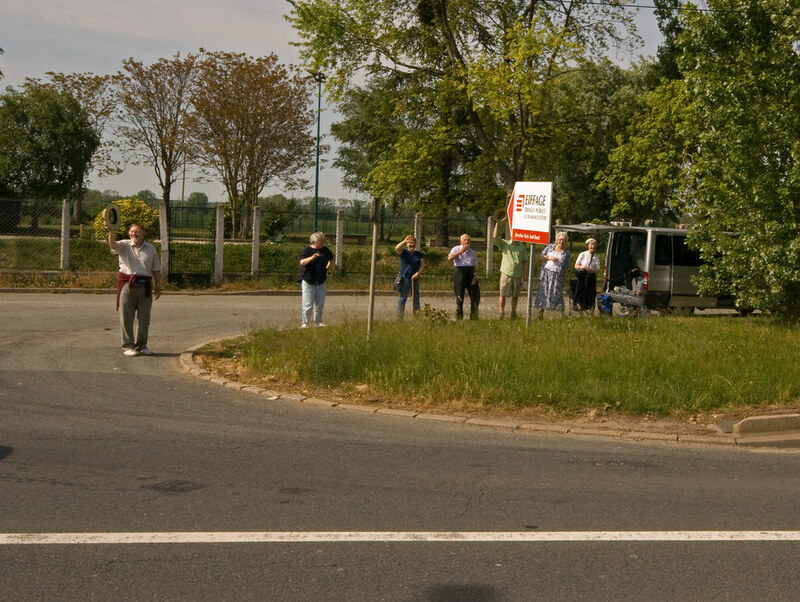 Despite the length of the walk people don't tend to lag behind; there is a good esprit de corps, and when things get really bad you simply avail yourself of the Order of Malta medics, whose vans are to be seen at intervals at the side of the road, and / or the transport provided to take the 'fatigued' to the next stop. and loos. I spent much of the time asleep, but did manage to see a lot of chapters pass when the column caught up with us, such as these. Chapters are marked by banners, or failing that with a painted wooden cross with their name on it; they often carry national flags as well, and occasionally, like this one, a small statue on a bier. 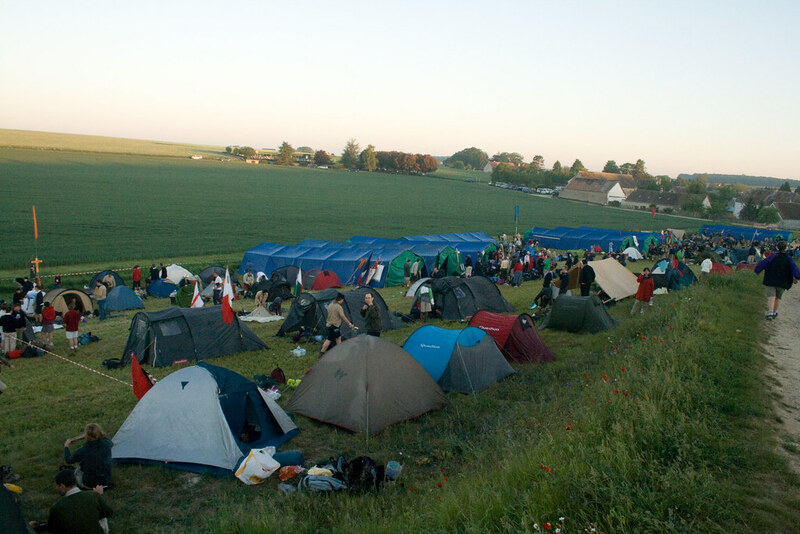 The two camp sites, at Choisel and Gas, are staggering feats of organisation. There are large 'communal' tents for different nationalities (men and women separate), and open spaces for those with individual tents - 'pop-up' tents have become very popular, and I found mine excellent. To say that washing facilities are basic would be an understatment. Soup in the evening and coffee or hot chocolate in the morning is provided, with the ubiquitous bread rolls which also appear at lunch time, but otherwise food is the responsibility of the pilgrims. Pilgrims carry a small bag on their backs mainly for their lunch. All the heavy luggage, including tents, is taken by lorry. 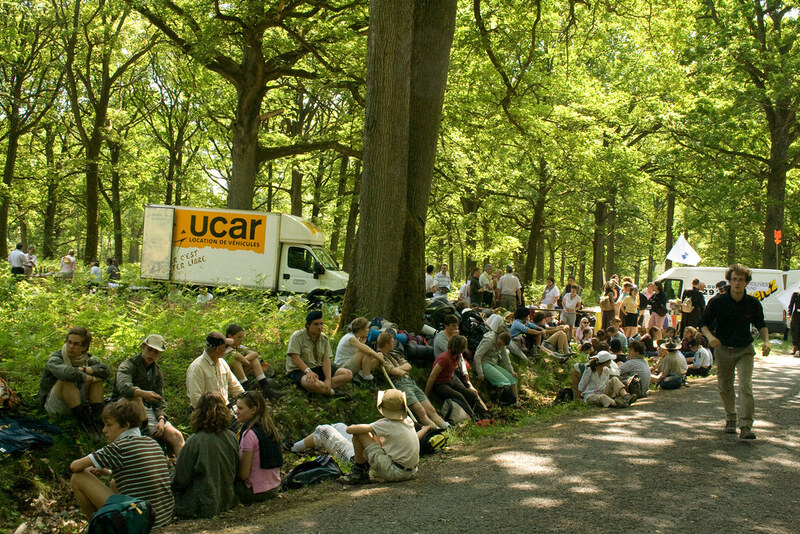 Lorries, bags, and the correct area of the campsite for your group are indicated by a system of colour coded ribbons. 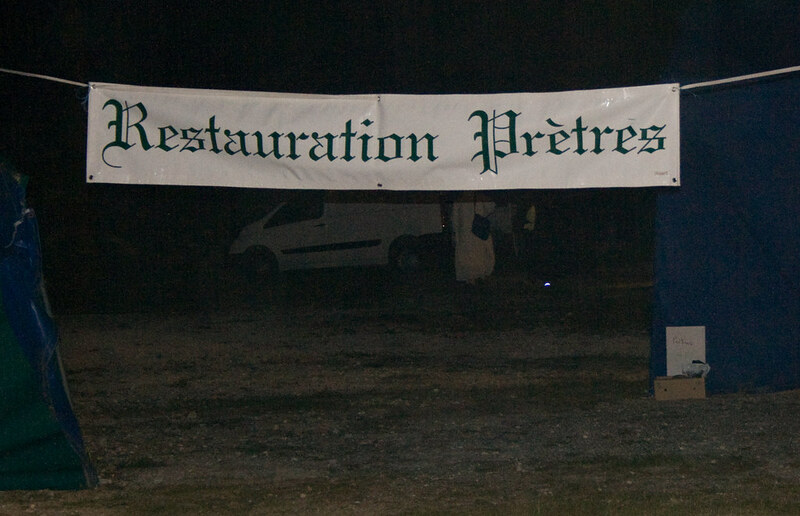 where they were being given a more substantial evening meal. In the morning I saw them saying their private Masses in a special tent in the same place. 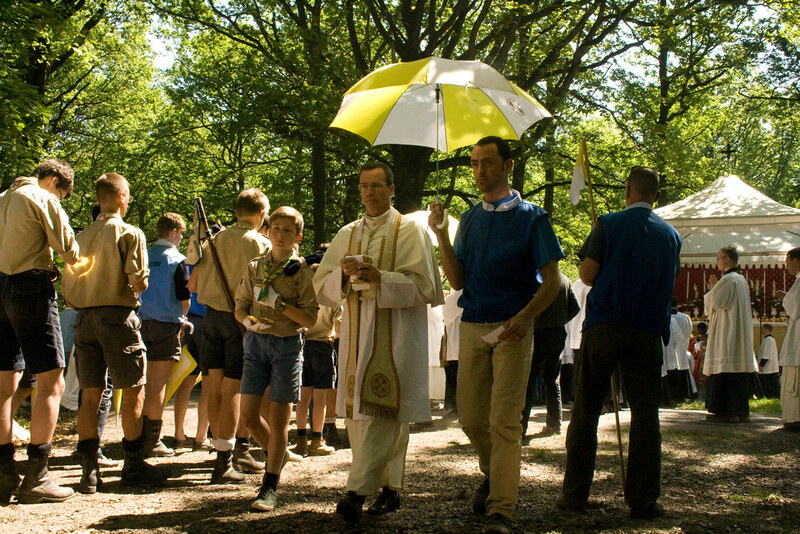 I'm glad they get looked after a little, since walking in cassock and surplice must be quite something in the heat - or for that matter the mud. In my next post I'll say more about what it is actually like. My IPhone charger passed away after we arrived in Chartres, which meant I couldn't immediately blog about the Mass we had in the Crypt on the day of departure. Charging up over night outside in the French countryside, attached to a gantry of power sockets powered by a portable generator, proved too much for the poor thing. I have now processed the photos taken by my 'real' camera and uploaded them to Flickr; I'll be doing some more posts with them. 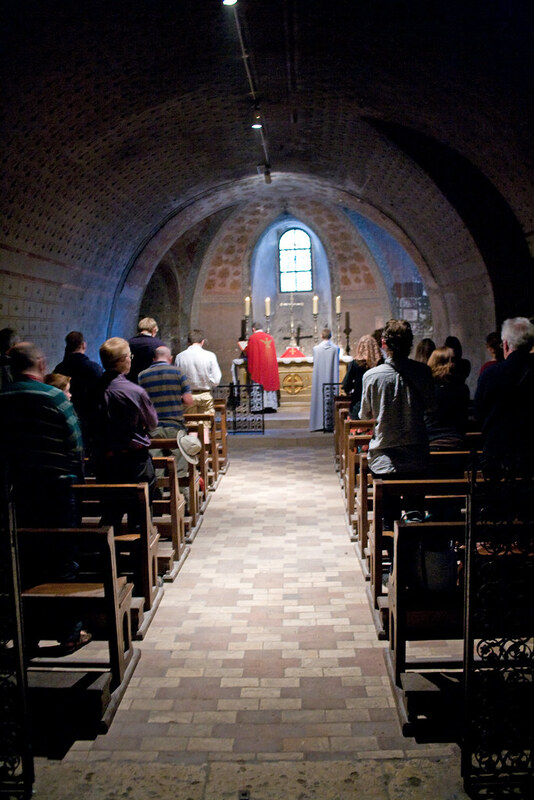 First of all, however, here is the Mass we had in the Crypt of Chartres Cathedral - not, alas, in the shrine chapel of Notre Dame Sous Terre, since the group in there before us was running late. 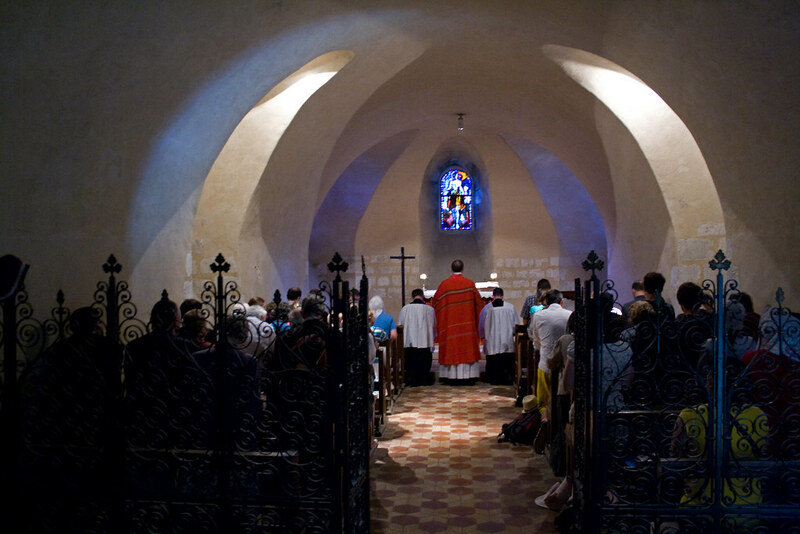 Nevertheless, the crypt was a fine sight with our Mass, the Mass for the Irish group, and private Masses going on simultaneously in neighbouring side chapels. Here are the Irish assisting at Mass said by their chaplain, the charming Fr Cahill. And Mass said for the British chapters, by Fr Martin Edwards. 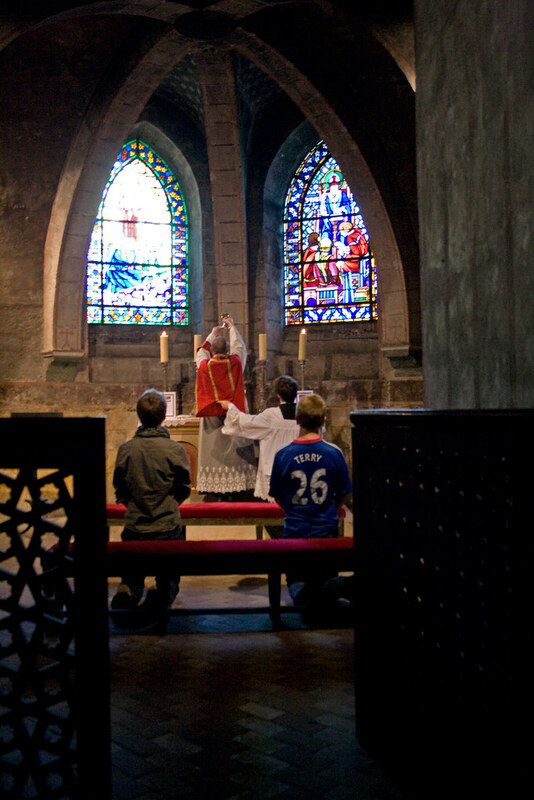 The chasuble is alas characteristic of the taste of the Cathedral authorities. 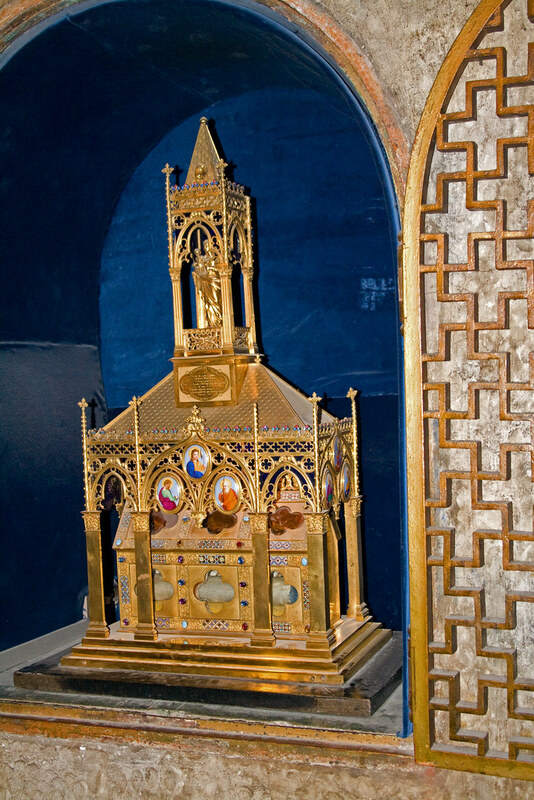 The Shrine chapel, set up for a French group, showing the shrine image and also, on the far wall, the reliquary of Our Lady's Veil, the greatest relic of the Cathedral, and one of the truly great relics of the world. 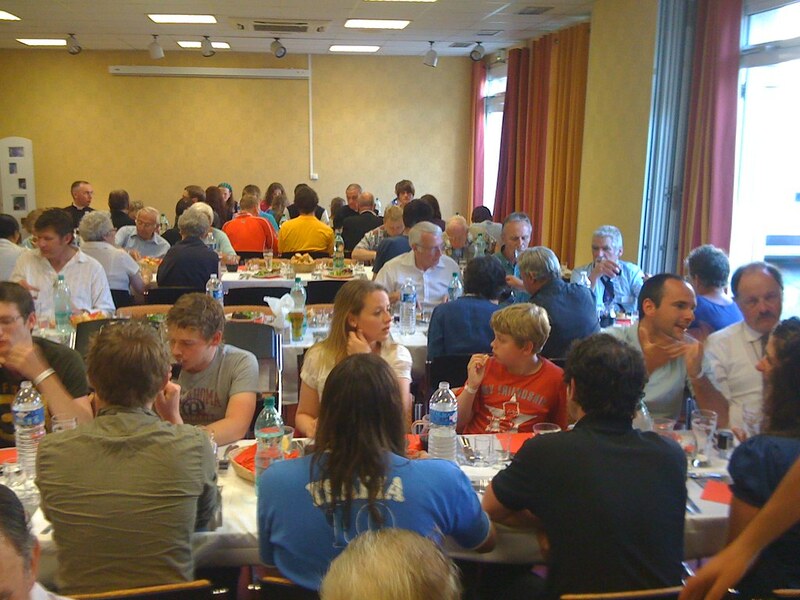 After the Solemn Mass on Monday, we were able to wash and change in a rather comfortable hotel before a dinner with all the British pilgrims: 110 in total. The Masses above took place on Tuesday morning, and after a short period of free time to look round the Cathedral and say some prayers before the shrines, we got onto the coach for the return journey. A wonderful and unforgettable pilgrimage. 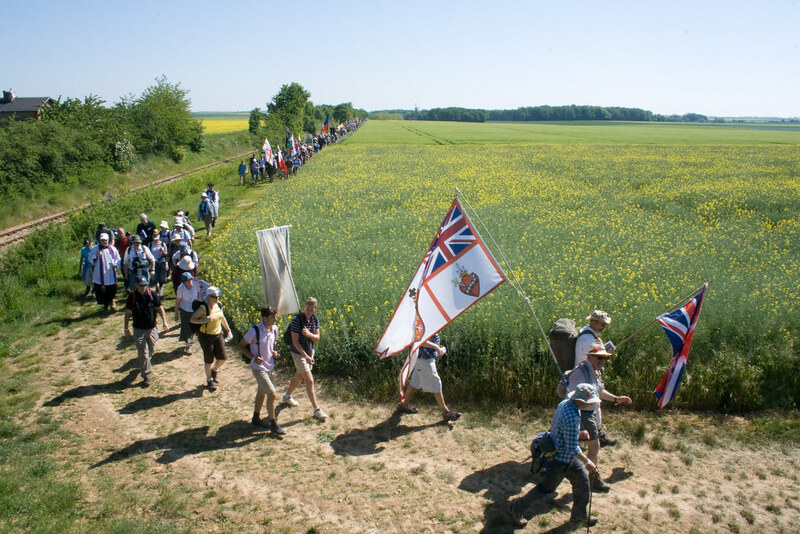 A remarkable number of the British pilgrimes have done it ever year for fifteen years or so - it is clearly habit-forming! 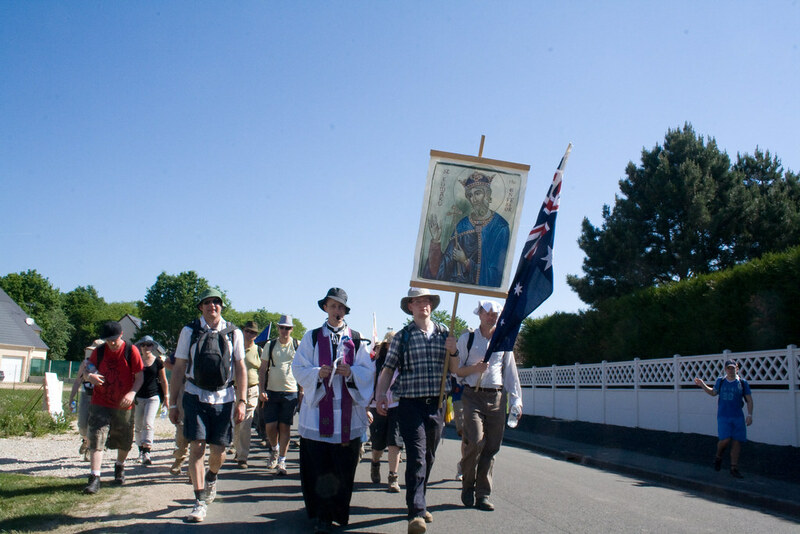 The organisation is very smoothly done by Francis Carey, whose father organised the first British contribution to the international pilgrimate in 1992. More photos and commentary to come! I found the Shrime of Our Lady if the Pillar, one of the three shrines od Our Lady in the Cathedral. Tomorrow we are having Mass in the Shrine of Our Lady 'Sous Terre', the oldest shrine, in the Crypt. 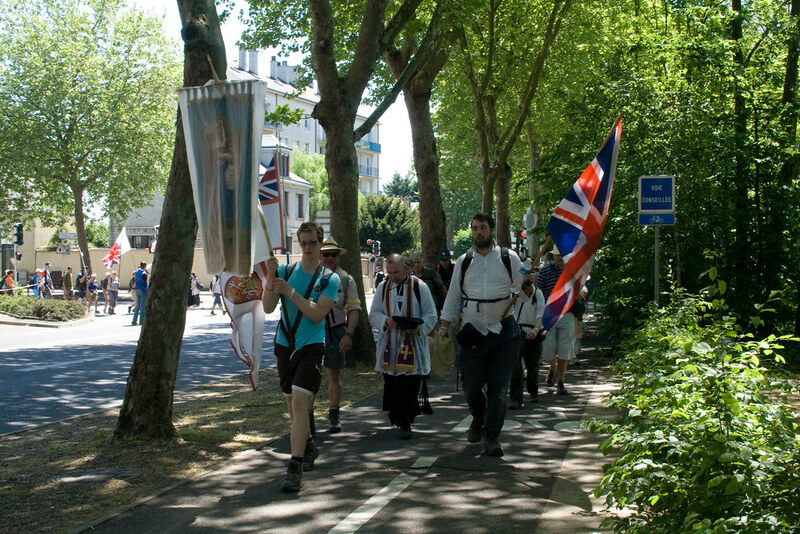 I've been carrying the Union Flag, which we have with our chapter along with the banner of Our Lady of Walsingham and a specially designed flag which includes the Sacred and Immaculatr Hearts. The last day is relatively short, about 15 miles. We get to the Cathedral in time for Mass starting at 3.30. Being fairly near the front we have arrived long before many others. The standard bearers are waiting on one side; we will be ushered into the choir, apparently, with our banners. At the moment I'm sitting on the pavment outside; the great bell of the Cathedral has begun to ring for Mass. 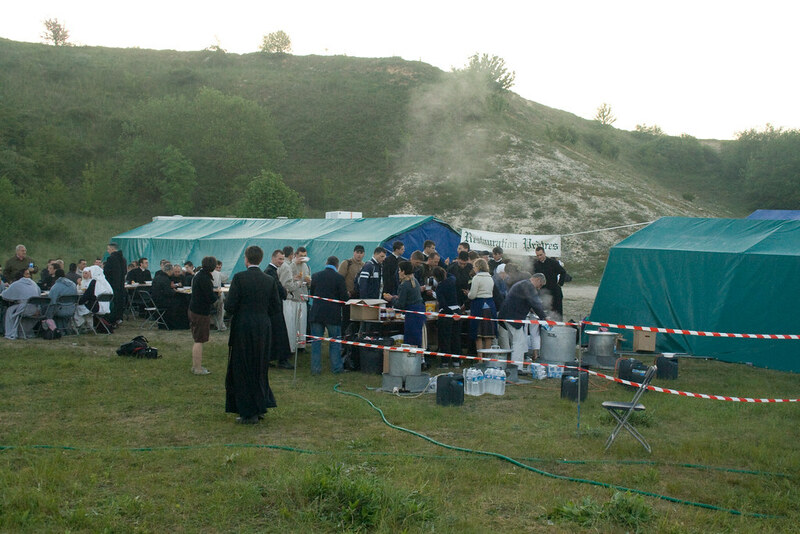 More pics: private Masses at Gas camp. My view of the road. Fr Bede Rowe with the Juventutem chapter. have a Solemn Mass (yesterday it was Missa Cantata). 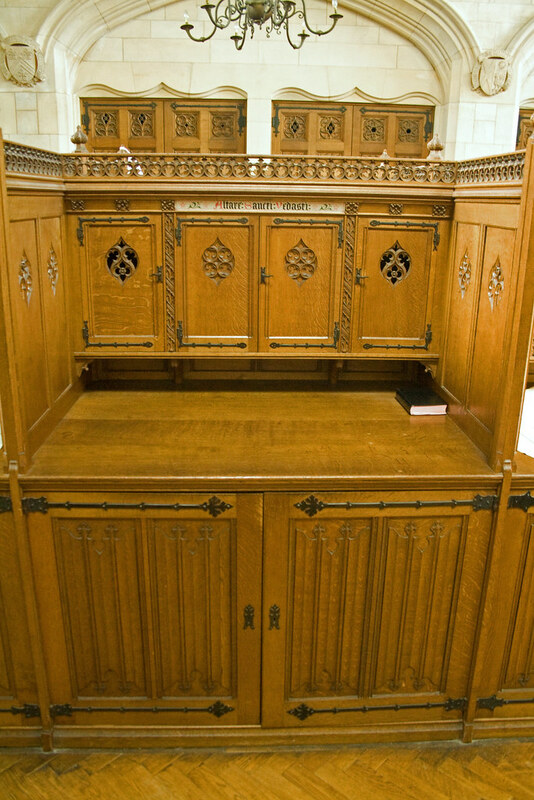 There are ranks of priests in choir; others are hearing confessions, it seems behind every tree! 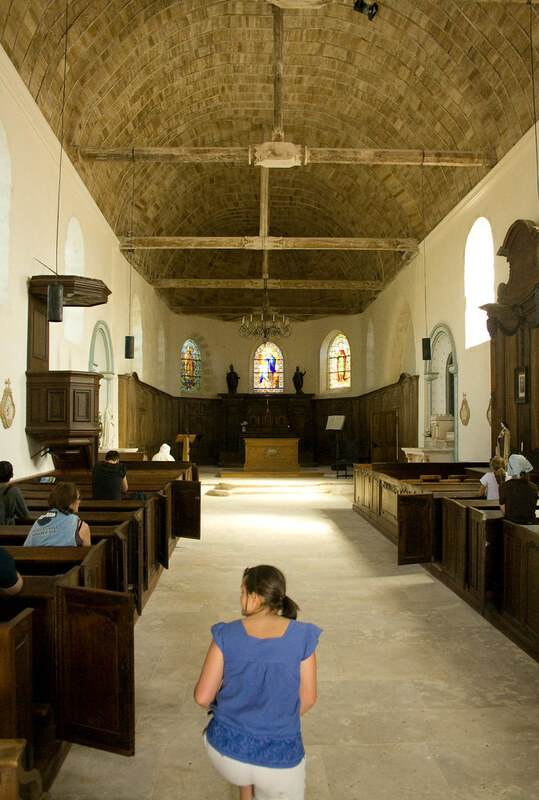 They walk in cotta and purple stole, and hear many confessions as they go along, the chapters leaving space for them and if necessary coming to a halt when the penitent kneels for the absolution. 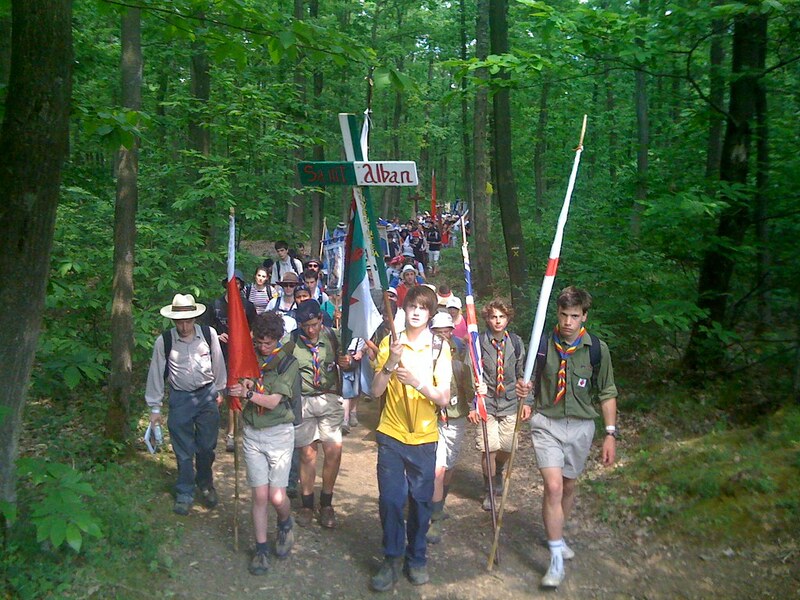 At the Mass, one particularly touching sight is the lowering of half a dozen banners by boy scouts at the Consecration. When they processed it, they made the same reverence to the Cruxifix before going to their spot to the right of the altar. The singing is pretty good - very high and slow, in the French manner. There is a schola of clerics and a mixed lay choir. Their singing is amplified by gigantic loudspeakers. 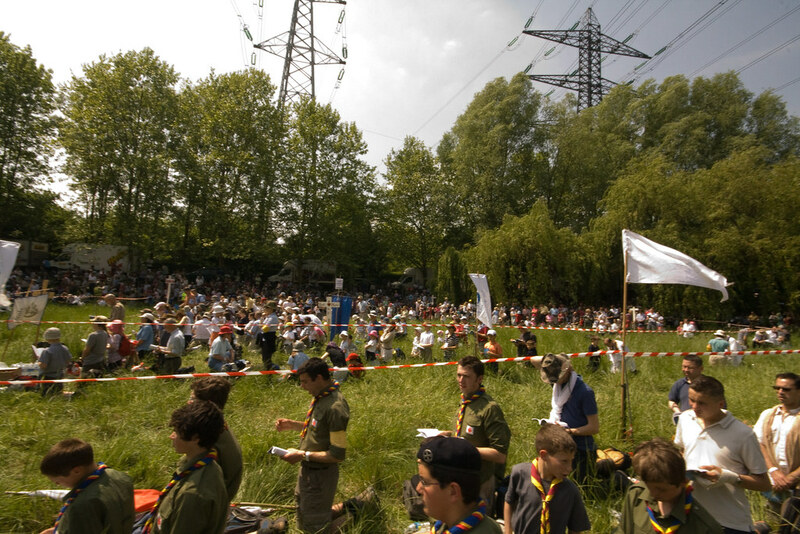 The organisation of the pilgrimage, the setting up and taking down of the camps, marshalling the traffic and distributing water at the stops, is hugely impressive. I have walked all the way so far but my blisters are going to force me to take the afternoon off; with luck I'll be able to walk again tomorrow. Right now I can't manage much more than a shuffle! I am taking better pictures with my real camera and they will be online in due course. 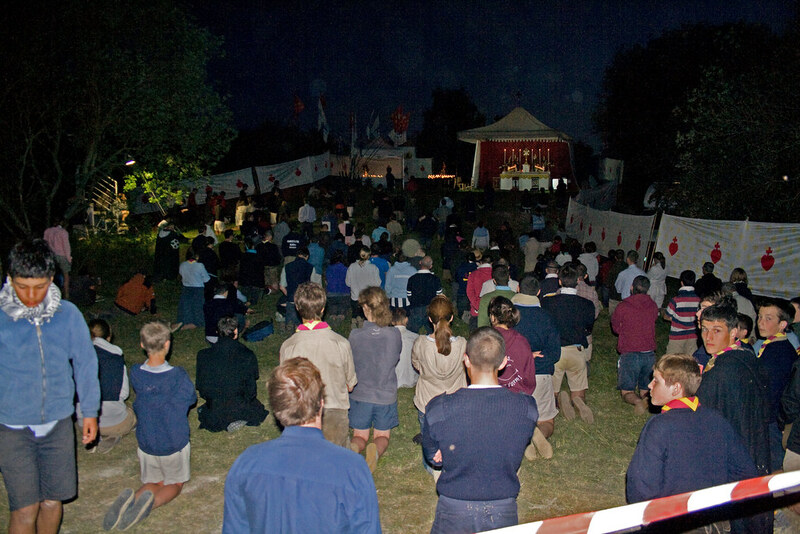 The vast crowd of pilgrims has stopped for an open air Mass. 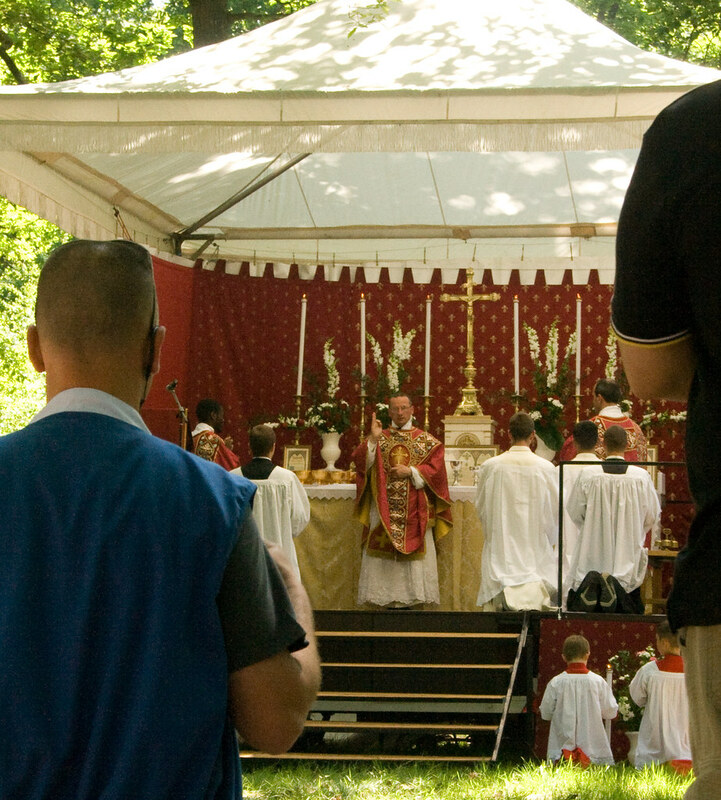 The altar is in an open-sided tent. This is also our lunch stop. 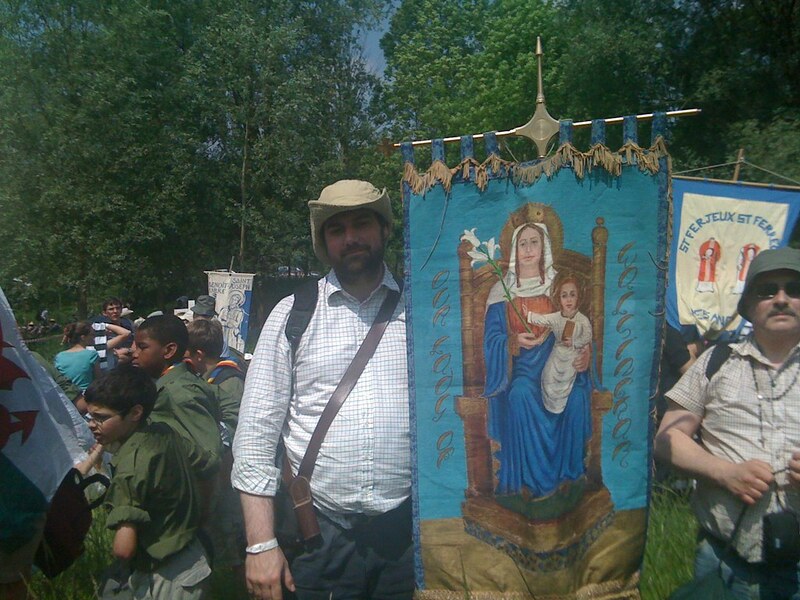 On the last leg I was carrying the banner of Our Lady of Walsingham. We were up while the larks were safely tucked up in their nests to get to Notre Dame Cathedral for 6am. by region and chapter. The British are part of the 'Estragers' group, which is grouped with the French from Normandy. There are a number of Germans with us. Fr Martin Edwards, we are now off on the coach to catch our ferry. Fr Gerard Byrne said Mass for us. We also have Fr Redmond and Fr Rowe with us. The Crypt at Westminster Cathedral is the final resting place of Cardinal Griffin and Cardinal Godfrey. Fr Edwards reminded us that in the dark days of the 1980s the Traditional Mass was said there. the important Catholic bio-ethics institute which is supported by all three bishops' conferences of the British Isles, from London to Oxford is an exciting development, and I was delighted to join it's Board of Governors this year. It is developing rapidly as this press release makes clear. Dr Helen Watt will hold the post of Senior Research Fellow when she steps down as Director. She said "We are delighted to have attracted someone of the calibre of David Jones to the Centre: his appointment will raise the Centre's international recognition to a new level. I look forward to working with David to ensure the Centre builds on its excellent reputation both academically and as a source of practical advice." Professor Jones, who will take up his post in July, said, "I feel honoured to have been appointed as Director of the Linacre Centre, soon to be the Anscombe Bioethics Centre. It is an exciting time to take up this role: The move of the Centre to Oxford and our developing relationship with Blackfriars is a great challenge and an opportunity. Catholic bioethics must learn from the greatest thinkers of our age and must make its own voice heard at the highest level of academic debate. I aim to work with colleagues in engaging openly and eagerly with the key ethical issues of our day." **There is already a Linacre College in Oxford which would lead to confusion, so the Centre will shortly be changing its name to the Anscombe Bioethics Centre, after Professor Elizabeth Anscombe, a Catholic philosopher whose intellectual and personal interests included an interest in bioethics. The Centre now has office space provided by Blackfriars Permanent Private Hall at Oxford, but hopes to raise funds for a building of its own to accommodate both the Centre's staff and its library, which is currently in storage. 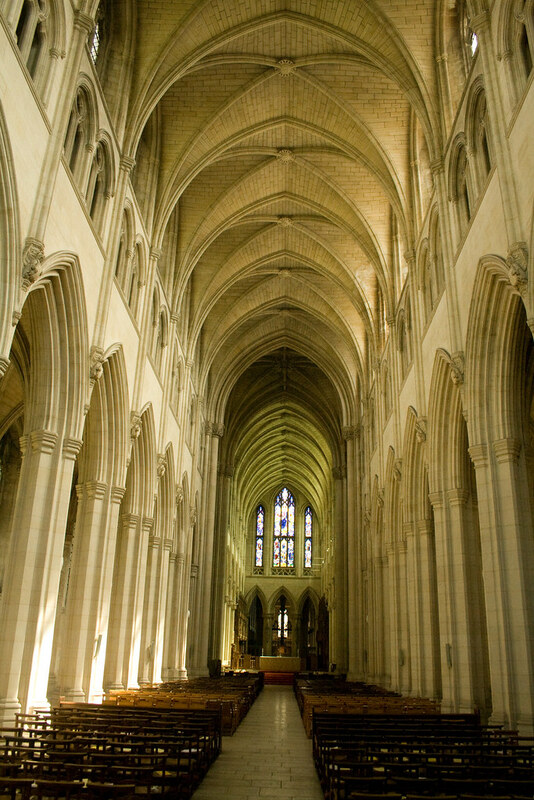 The Latin Mass Society has recently announced its next Conference for training priests to say the usus aniquior of the Roman Rite, the Traditional Mass, to be held at Downside Abbey. 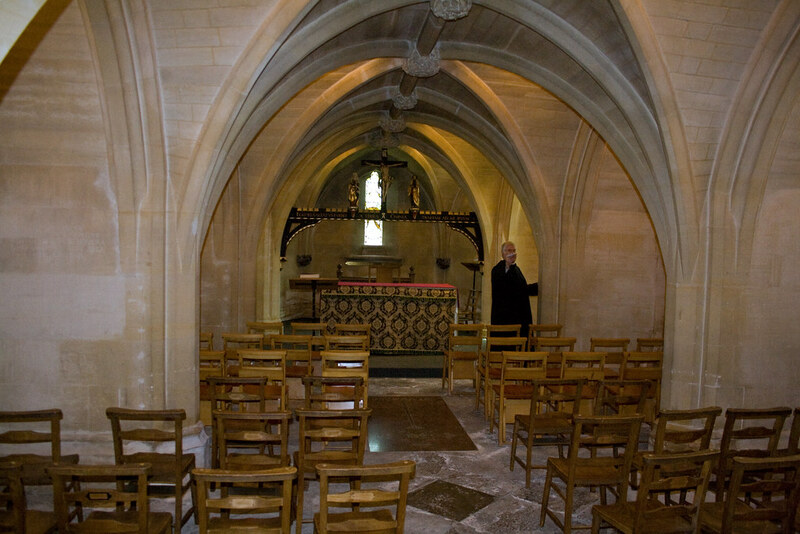 Downside Abbey is in Stratton on the Fosse, Somerset; the dates of the conference are are Tuesday 10 to Friday 13 August. The inclusive fee is £115; we have it on good (episcopal!) authority that parish priests can claim this from parish funds as a parish expense. In any case this is enormously subsidised by the Latin Mass Society and represents very good value for money. Priests interested in attending should contact the LMS office on 020 7404 7284 or e mail: info@latin-mass-society.org. Yesterday I was in Downside with our Treasurer, Paul Waddington, who is the principle organiser of these events and took a few photos. 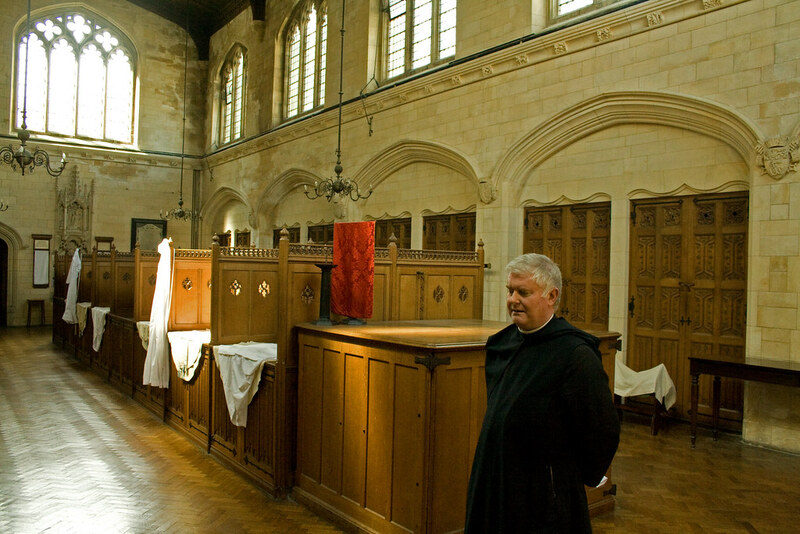 We were shown around by Fr Boniface, and although I know the Abbey Church well I was fascinated to see the magnificent sacristy, shown in the pictures below. 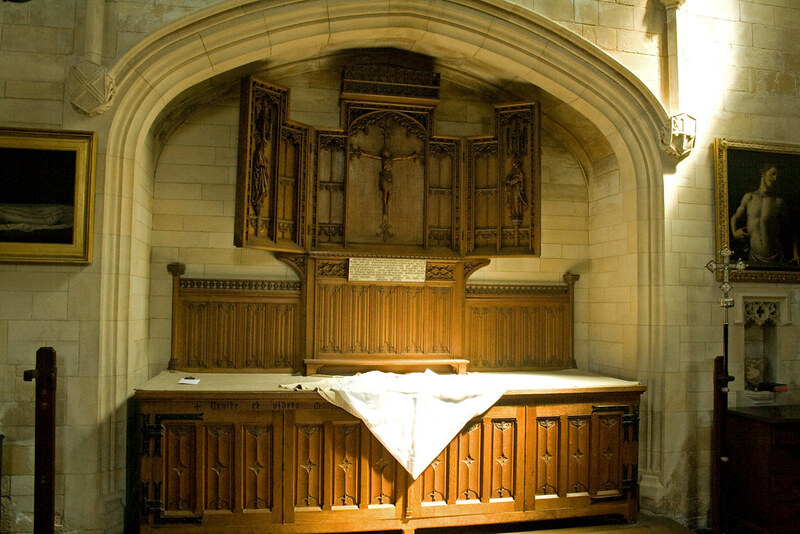 As as Ushaw there are many richly decorated side chapels intended for private Masses, including the shrine to St Oliver Plunket, and Abbey Church itself is one of the very finest Catholic ecclesiastical buildings in Britain. 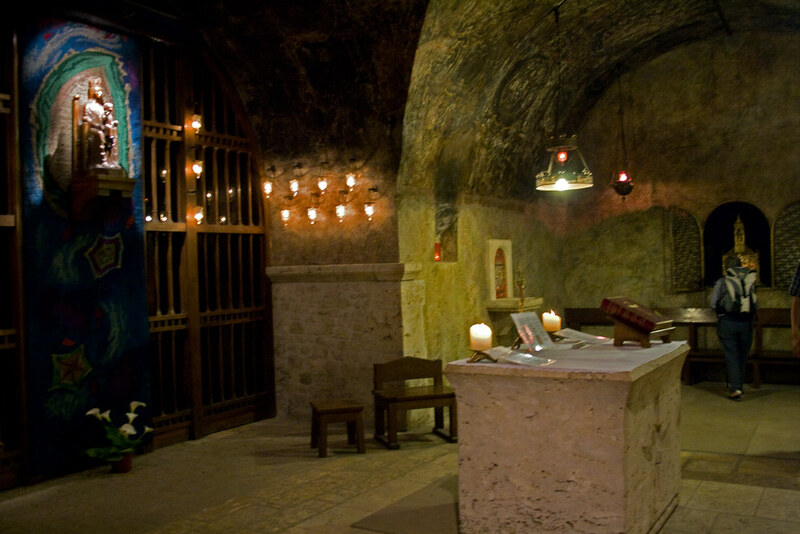 The Conference will also have the use of the 'Old Chapel', used by the monks before the Abbey Church was built, and the Crypt. 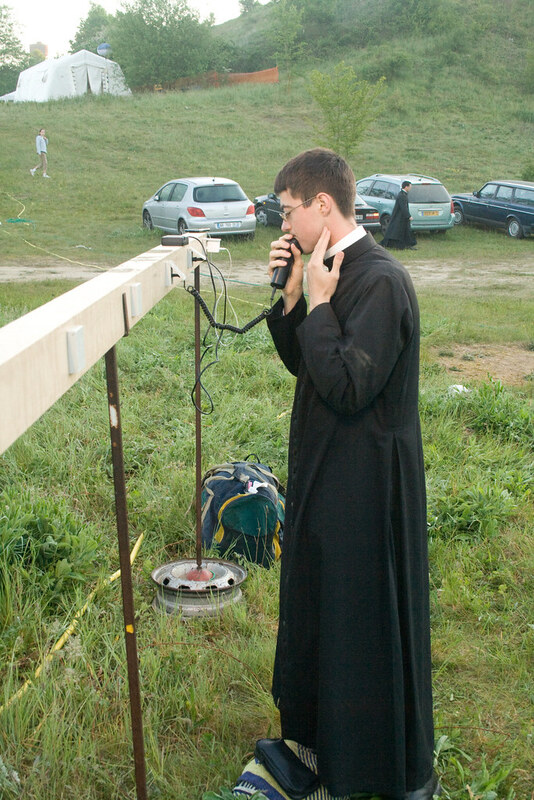 Among the tutors at the Conference will be Fr Armand de Malleray FSSP, who has been very dedicated to the cause of training priests at successive conferences, and Fr Bede Rowe, who is Parish Priest of nearby Warminster and now the LMS' Chaplain for the South West. 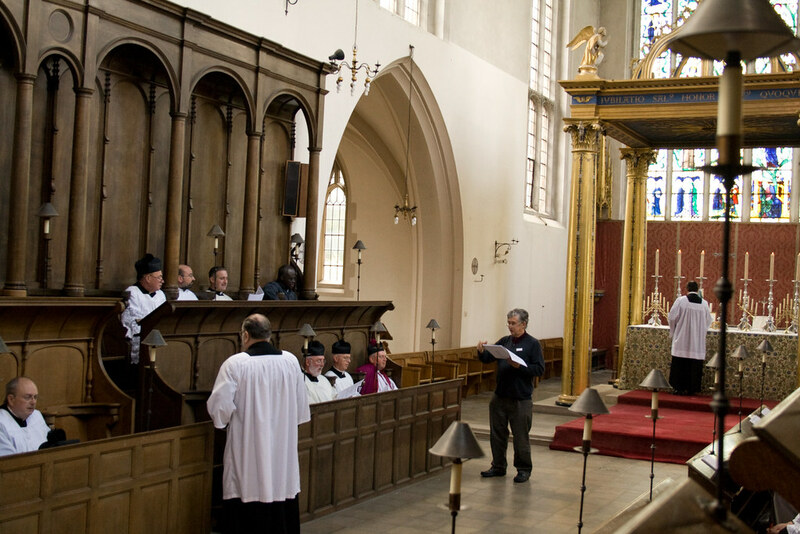 Colin Mawby, the well known composer and former Directors of Music at Westminster Cathedral, will be available to teach priests the chant, as he was in the conference the LMS held at London Colney - as shwon in the picture below. Finally, here is a statue of the Virgin and Child in the Crypt.